A beautiful tribute to a great man, Vigil! Peace and Patience says it all. Thank you for the post. I hope you don’t mind if I share this. And i love your work dear friend. 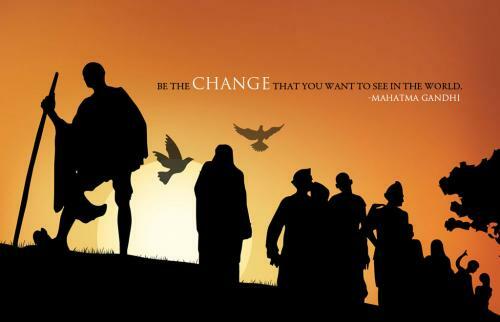 Mahatma was a man of peace and also a man of action. Thanks for honoring this great man. A great tribute to a great man. “Personification of peace and patience”, the world is in dire need of another Mahatma. It is lovely to meet another poet. Your words stir the soul. Thanks for visiting and liking soulsnet because now I have followed you here. The above–quite beautiful–and the sentiment, if not the exact words, incidentally, inspired my sonnet and its haiku introduction, it was something that was sparked within me on the site of another blogger, coincidentally enough. But the work was not finished here yet. I remember finding the quote, being amazed at the coincidence and sending you the above. Very nice honest tribute to Mahatma. Vigil Kumar, your style is distinctive and effective. Thank you for liking my post! I plan to revisit your site. Wonderfully written. A beautiful tribute. We seem to appreciate and want to restore similar values in the world…I wrote a tribute to Mandela last year and appreciate your admiration and mourning for the lack of such leaders today. Thank you for honouring what is honourable. Hello Vigil. Thank-you for stopping by my site and following along! I’m very pleased to meet you. I look forward to hearing more from you! I comment, like, and agree. I prefer to see this be. A most excellent tribute ! Wonderful tribute. I always liked those words from Gandhi, because it’s so true. Valiant warrior of Non-violence – from my Protestant Christian roots reminds of hymn “Onward Christian Soldiers” but certainly not the same as the Crusades a thousand years ago. More in tune with aims of Salvation Army charity organization. A great tribute in perfect words !